A limestone barn converted into two topsey-turvey cottages overlooking the cobbled yard, hills and copses. Walk from the cottage door into the wonderful white peak. Near Dovedale Tissington & Carsington Water. 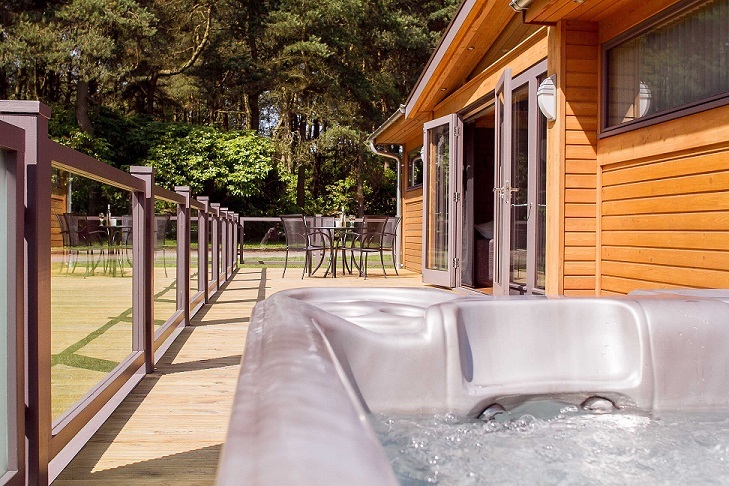 Luxury pine lodges to sleep up to 8 in a country park setting with indoor pool and restaurant. Both Darwin Forest, near Matlock, and Sandybrook Country Park are the perfect place to holiday with your dog with an abundance of walks on your doorstep and numerous pet friendly local attractions and restaurants. Set on the Chatsworth Estate with magnificent views of Chatsworth Park and within walking distance of the House, The Cavendish makes an ideal base to explore the Peak National Park. Spacious, well furnished bedrooms, two restaurants, elegant public areas and relaxing atmosphere. Special inclusive breaks offered. Set in the heart of the Peak District National Park, between Buxton, Bakewell and Castleton, Hargate Hall offers 12 self-catering apartments providing accommodation for large or small groups, holidays or short breaks. Ideal for walking and activity holidays, or just 'taking it easy'. Elton Holidays, near to Matlock and Bakewell in Derbyshire, offers the holidaymaker a choice of 4-star-rated, quality bed-and-breakfast accommodation in their guest house. Nestling in the tranquil backwater of Prestwood with breathtaking views towards the dramatic Weaver Hills, this beautifully renovated cottage with 4-poster bed and its own private garden offers an excellent retreat for the discerning holidaymaker.